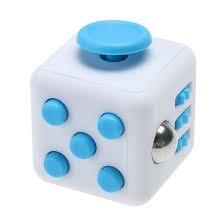 A couple of months ago when visiting Cape Town, a friend asked me to take a Fidget cube over for her son. I did not think anything of it at the time other than noticing it was a hand-sized gizmo, comprising a plain plastic box with various buttons and sliders on each side – intended to be fiddled and twiddled with. Spin, glide, flip, click, roll and breathe – so says the marketing blurb on the website. You can also play with it without having to look at it. And it is very tactile. The inventors of the Fidget Cube, Matthew and Mark McLachlan, set up their company through Kickstarter – to create “an unusually addictive, high-quality desk toy designed to help you focus. Fidget at home, in class, and at home in style.” Moreover, the company targeted it primarily at kids with ADHD to help them focus when sitting still. It is little wonder that so many parents saw it’s potential to help their kids, who get so easily distracted from what they are doing. Then its snazzier cousin, the fidget spinner, arrived. An even simpler device with a button in the middle, that when pressed, results in a dizzying array of colours appearing to whir around the moving pieces. The spinners are cheap and cheerful and come in all shapes, colours and sizes. In a matter of weeks, they became the summer craze of 2017, worldwide. Every child (and many adults) has at least one; not just those who have ADHD. 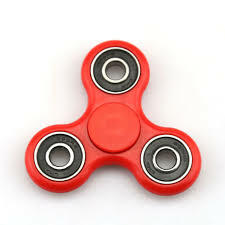 According to Wikipedia there has been so much demand for the fidget spinners that several factories in China, that used to make cellphones and phone accessories, cottoned on and switched to making fidget spinners. The fidget spinner is truly a game-changer – changing how kids fidget. Moreover, what started as being a toy for kids with attention problems rapidly became a universal toy that every kid wanted. A brilliant invention. In my childhood, we had clackers we would hit up and down to make a loud clicking sound. It was very satisfying to make the rat-a-tat noise but quite different from making colours fly. What next I wonder? Nowadays, the aspiration of every new start-up company is to create something that is going to be a game-changer. But you never know what will go viral and be the must-have toy. Ironically, many schools have now banned the spinners from their classrooms – as they have become more of a distraction than an anxiety reducer. While my sister-in-law’s school still provides the fidget cubes for their ADHD kids, they have banned the spinners. But the cubes don’t seem nearly as much fun as the spinners, having something whirring around, like magic, in your hand.